Wigan Atheltic fans have their say on another eventful week. 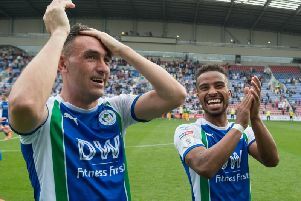 Latics experienced the first significant setback of the Championship campaign last Saturday when they lost 1-0 to Queens Park Rangers, who I expect to be amongst this season’s relegation candidates. Latics were the better team at Loftus Road, but they were treated harshly by referee Steve Martin who made several game changing decisions in Rangers’ favour. Following a corner the referee allowed a blatant push on Chey Dunkley to go unpunished and Tomer Hemed was allowed to score what proved to be the winning goal. Despite being informed by his assistants of the foul the referee ignored their advice and bizarrely awarded the goal. Latics had several good shouts for penalties in the second half when they pressed for the equaliser but the referee just wasn’t going to give them any of the big decisions on the day. It was an especially frustrating result because if they had secured the three points they would now be third in the table. Paul Cook was clearly upset by the referee’s performance but he will want his players to manage the disappointment and channel their anger and frustration by getting the three points against Rotherham United tomorrow. Wise leaders, like Cook, will channel energy toward useful behaviours, like working on an improved performance rather than the destructive feelings about the referee. As well as preparing his team, Cook may have to make changes to his preferred starting 11 tomorrow. Injuries to Michael Jacobs and Gavin Massey may rule them both out and Latics are already without Darron Gibson and Dan Burn who have longer-term injuries. Rotherham manager and former Latics striker Paul Warne has done a very good job since taking over the hot seat at the New York Stadium gaining promotion via the play-offs in his first full season in charge. The Millers have six points from their opening five Championship fixtures with two victories against Ipswich Town and Millwall and three defeats against Brentford, Leeds United and Hull City. Rotherham lost 3-1 at Everton in the Carabao Cup second round on Wednesday night and Cook will be hoping that with Latics having no midweek game that this can work to their advantage, although the Millers did rest eight players from their last Championship starting line-up. Warne’s team are likely to pose a big threat at set-pieces and Latics fledgling centre-back partnership of Dunkley and Kipre could have a busy afternoon at the DW Stadium. However, Latics have had more shots than any other team in the Championship so far this season and if Nick Powell can continue to dictate the play, I expect them to get back to winning ways tomorrow. It’s that roller coaster that is football again. The surging highs of Stoke followed by the crashing lows of QPR. How can a team produce two such different results within the space of a few days? At times like these, football fans reach for that cliché, and state categorically, that this is typical of their side. If only the team were a bit more consistent. It’s always like this. The truth is that, because all football fans reach for this cliché, it isn’t actually a feature of their team. In fact it is a feature of football generally. It happens to all clubs. It is one of the reasons why football is the greatest game in the world. This sort of thing happens a lot. That is why we should never believe the spin that ‘the Premier League is so competitive’ which is trotted out whenever a side in the relegation zone beats one in the top four. It is not a feature specific to the Premier League – it is a feature of sport generally, but I suggest of football more than others. That is why we have cup upsets. That is why the league never is actually won by Christmas. It is also more likely to happen in a more competitive league like the Championship. We should just be glad that we are winning some of our games and therefore can get disappointed when we lose unexpectedly. During our last two appearances at this level we never lost unexpectedly. Those campaigns didn’t have the sort of crashing disappointments that we saw last Saturday. They were just a valley of despair from start to finish. Where defeats were met not with anger or frustration, simply with glum acceptance. And so we have no idea what awaits us when Rotherham come to visit the DW Stadium. The Millers, who many people predict will finish bottom of the league, have had a decent start and arrive just one point behind the Latics. We can’t even look to past games between the sides to find a winner. Even ignoring the 3-1 League Cup defeat earlier in the season, games between us have produced mixed results. There was the worrying 0-0 draw at the DW back in April and the great three-one win last November in New York! The previous season there was a fantastically entertaining 3-2 victory at home just before Easter, and that devastating 2-3 defeat on Boxing Day when we were three nil down at half time. So there is no clear guide as to what will happen. In fact the only thing we should be sure about, is that there will be goals. Latics are the joint third top scorers in the division and we’re playing against the third leakiest defence. That said, we all know that our back line is hardly the Hoover Dam! So it looks like goals on Saturday. Hopefully plenty of them. For Latics. We have had some very entertaining games so far this season, let’s hope that this weekend sees another one. And that Wigan can start to ascend the hill towards another surging high on the football roller coaster. So blame me when we lose one nil in the last minute of a game that had nil all written all over it. I’m sure there are other things that people do to fill the void but just imagine for a second what life would be like without football? It is an all-consuming force which does wonderful, and occasionally terrible things to your emotions. I’m not necessarily talking about the wide gamut of feelings expressed during a typical match. And I’m certainly not talking about the overwhelming saturation of top flight football in particular which we’re told is the be all and end all in the modern game. No, there’s also those emotions that take place inside one’s own head. I mean your head or mine of course when I say “one” – sorry for poshing things up a bit. I’m not the only one on these pages to perhaps make disparaging remarks about some of the rabid online over-reactions to every trivial event that takes place in the life of Wigan Athletic FC. Yet, we have to concede that football sends us all on a journey and messes with our head from one game to the next. The wins against Sheffield Wednesday and Stoke were enough to send us all a bit giddy: Paul Cook’s built a good team here – yes I know we all said that staying up is the priority but we could go for promotion again! Look at all our wonderful players, look at how well Grigg and Powell are playing together. We’ve got pace on the flanks, loads of options in midfield and a team spirit that means that we will give any team a good game, no matter how many good (expensive!) players they’ve got! However, you’re only as good as your last result and ours was a defeat against a team bottom of the table with zero points with a manager who has a hair island. You’ll have to seek out Bob Mortimer and Andy Dawson’s Athletico Mince podcast to get that reference mind you. Sure, we can moan about there being a foul in the lead up to their goal, but how many goals did we score, against a team who were bottom of the division? A team who had let seven in the week before! It was wonderful to turn over Stoke at their former fortress but maybe they’re not all that, maybe they are in freefall, maybe they are this year’s Sunderland ™. We know all about the player malaise that often happens when you go down from the Premier League, when they’re still earning top wages but don’t want to be there don’t we? Of course, what is really irking me, above all else, is that Bolton and Blackburn appear to be doing so well. Don’t they know it’s our job to be the perennial underdog, always punching above our weight? How dare they steal a march on us! The truth is that we are five games in, and still finding our feet. Though it has to be said that sending out a statement nice and early sets your stall out for the season, it is not always representative of the nine months ahead. So far it’s played 5, won 2, lost 2, drawn 1, 7 points and a solid 7 out of 10 from me. With that we come to Rotherham, or rather they come to us. “going out on a high” syndrome before two weeks off. The fact that the Millers were favourites for relegation but are only a point behind us, and of course, managed to banjo us out of the League Cup a couple of weeks ago for good measure too. Is this the first (relegation) six pointer of the season? No, that would be ridiculous! Is it a game we could do with winning? Absolutely, but for the purposes of giving ourselves breathing space, not for a tilt at promotion. Thus the cycle will begin again. Win and we’re going for the play-offs, lose and we’re doomed to relegation, draw and a season of consolidation awaits. With a typically measured close, I’d like to imply that the latter scenario is the most likely one. It would be nice to challenge but of the teams we’ve played so far, only Aston Villa look like they will be up there, the rest are all bottom half currently. We’re yet to play the early front runners such as Leeds. Just imagine how intolerable they will be if they carry on their form? Although nobody can deny they’re overdue a decent season. As for us, well, keeping that points tally ticking over, plenty of entertaining football and keeping hold of the most prized asset in Cheshire since Tatton Park, one Nicholas Powell, will do nicely for me. Well last week couldn’t have been more Wigan Athletic if it tried. A midweek 3-0 win in the backyard of the pre-season title favourites followed by a 1-0 defeat away at bottom of the league who hadn’t won and had conceded 10 goals in their previous two games. Having said that, it’s clear to see that referees still need all the help they can get after Steve Martin somehow let QPR’s goal stand despite Chey Dunkley receiving a clear push in the back. I really don’t like blaming officials for results and I wasn’t at the game, but it’s disappointing when you hear from Paul Cook that he and his staff were informed that the linesman flagged for a foul – only for the ref to overrule the decision. That suggests to me that the person in the middle needs more support. With VAR being largely successful in the recent World Cup in Russia, it needs to be implemented in as many leagues as possible sooner rather than later. It took the powers that be far too long to introduce goal-line technology to the game and it is still only being used in selected leagues around the world. In modern football where technology and money is rife, that simply isn’t good enough. Although it’s a very long season in the Championship and we mustn’t dwell on Saturday’s result, we were robbed of a clean sheet and a valuable point. I know the Rs were really struggling, but any point away from home in this relentless division is a great point. Anyway, that’s enough moaning for one week. I have every faith that the players will bounce back when we face fellow promotion achievers Rotherham at home this weekend. Up them ‘Tics. It was as sure a thing as you could find, as sure as night follows day you just knew after we beat Stoke so comprehensively on Wednesday that we would come up a cropper at Loftus Road. Our record there is abysmal and it really isn’t a happy hunting ground, apart from a Nathan Ellington inspired win in March 2003 we’ve failed to register a single win there in the last 15 years. The closest we probably came was that horrible night in the play-offs where Latics got off to the perfect start, but an exhausted side who were playing in their 62nd match of a draining season, fell behind in extra time as Harry Redknapp’s expensively assembled side reached Wembley and eventually the Premier League. You could say QPR have got what they deserved now – a hefty fine was dished out by the Football League earlier this year that Rangers will be paying back for years to come, and the last of those senior players that came in under the Redknapp regime have now left. Hence QPR’s torrid start to the season, Latics should and could have capitalised on that. Once again numerous chances went begging and without converting there was always the danger that something would come back to bite us. The manor of the goal conceded by Latics was frustrating, how the referee failed to spot a clear push in the back on Chey Dunkley is baffling. Especially when his assistants had flagged the foul to him, sadly it was only going to go one way after that, and again Wigan returned from the capital empty handed. Saturday’s result was a blip on a relatively positive start to our season, we shouldn’t let that defeat as disappointing as it was to mask what a great week it had been. Firstly getting a point at home to a fantastic Nottingham Forest side who have just knocked Newcastle out of the League Cup and then the win over Stoke that exceeded all expectations and showed that Wigan Athletic are indeed here to stay in the Championship. With that QPR match firmly behind us, and hopefully no further transfer outgoings on Friday Paul Cook can look towards a return to the DW Stadium with a full week’s worth of time on the training pitch with his players. The defence is looking stronger and the injury niggles that have been plaguing the squad have had a another week to settle down. Rotherham will be a difficult proposition, former Latics striker Paul Warne seems to have them well drilled and with the lack of budget of other sides in the Championship they’ve had to be creative over the summer. We know how dangerous they can be after the Carabao Cup defeat earlier this month, but if we perform like we have in the previous two home matches we should be favourites. So as August comes to a close I think it’s fair to say it’s been a decent month for Latics, the points haul could certainly be higher but the football we’ve been playing has been startling at times and also gives a glimpse of what we may be able to expect later this season. It’s certainly been a much more positive start than this time two years ago.